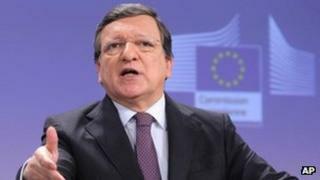 European Commission President Jose Manuel Barroso made the announcement following President Barack Obama's State of the Union address. The US said that "everything is on the table" in the talks. "A future deal between the world's two most important economic powers will be a game-changer, giving a strong boost to our economies on both sides of the Atlantic," said Mr Barroso, speaking in Brussels. The EU estimates that a "comprehensive and ambitious agreement" will boost annual GDP growth by 0.5%. Mr Obama announced US support for talks as part of his annual address to the US Congress on Tuesday, saying a free-trade deal would "boost American exports, support American jobs and level the playing field in the growing markets of Asia". It is not clear how long the talks will take, but similar trade deals have involved years of negotiations, and the BBC's Gavin Hewitt in Brussels says the most optimistic timeframe given by European officials is two years. One aim of the free-trade agreement would be to eliminate or reduce tariffs - taxes that apply to imported goods. For both the EU and US average tariffs are already low, below 3% on one measure. But further reductions could nonetheless stimulate additional trade and there are some areas where tariffs are much higher, notably food. Beyond that, the negotiations would try to reduce regulatory barriers to trade. That is more complex, but the experience of Europe's internal market shows it is sometimes possible. The desire for bilateral trade liberalisation on both sides of the Atlantic reflects the failure of negotiations for a global deal in the World Trade Organization. Those talks were launched 11 years ago and are nowhere near concluding. The big powers are anxious to use any opportunity to boost their economic performance. A US-EU working group was established in 2011 to discuss the prospect of a free-trade agreement. The US trade representative, Ron Kirk, said that even sensitive issues such as agricultural subsidies will be up for discussion. "For us, everything is on the table, across all sectors, including across the agricultural sector, whether it is GMOs [genetically modified organisms] or other issues," Mr Kirk said. "We should be ambitious and we should deal with all of these issues." EU Trade Commissioner Karel De Gucht told the BBC that free trade between the US and the EU had been under discussion for several years, and said he hoped talks would begin in the summer. But he admitted that the negotiations would be "difficult" and "complex", but he warned: "As the two biggest economies in the world, failure is not an option." The EU says the deal will focus on bringing down remaining tariffs and other barriers to trade, and standardise technical regulations and certifications. Currently the US and EU impose relatively low tariffs on goods traded between them, but analysts say other barriers are often in place to prevent European companies competing in the US and vice versa. One example is found in the car industry, where the EU and the US employ equally strict - but differing - safety standards, meaning that European car makers must meet both before they can sell cars in the US market, putting them at a disadvantage. Mr De Gucht estimates that such barriers are equivalent to a traditional imports tariff of 10-20%. Agriculture is also likely to be a significant bone of contention. The European farming industry is already heavily subsidised through the Common Agricultural Policy, and the European agriculture minister has already expressed reservations about the impact a free-trade deal might have. The US government is also likely to come under pressure from domestic businesses who have in the past called for protectionist measures to prevent the market from being swamped by cheaper Chinese imports. The EU has already said that certain "sensitive" sectors will require more negotiation but said no sectors would be excluded from the deal completely. The chief European economist at Barclays, Philippe Gudin, suggested that the emergence of China as an economic power along with other emerging markets has encouraged the US and Europe to unify in order to remain economic leaders. Mr De Gucht denied that they were seeking to combat Chinese growth, saying: "We are the leading economies and it's important that we remain the leaders, but in a way that allows others to develop." Steve Davies from the Institute of Economic Affairs, a think tank, said he believed the economic crisis in Europe was a far more important factor. "It's happening now because there has been seriously depressed growth in the EU, and this will be good news for economic growth," he said. "On the American side, the critical factor is that Obama is now in his second term, so he doesn't have the protectionist pressures from US businesses to worry about."